Mini celebrates 50th birthday | What Car? Mini celebrates its fiftieth birthday today and, to celebrate, the first model off the production line is returning to the plant at Cowley, Oxford, fifty years to the day since it left. 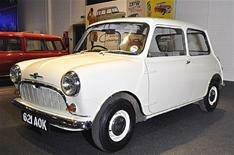 There were 602,817 original Minis produced on the Cowley site between 1959 and 1968, before production was moved to Longbridge, Birmingham. The Cowley factory, now called Plant Oxford and owned by the BMW Group, has produced more than 1.4 million new Minis since 2001. In total, six million examples of the old and new Mini have been built. 'Where is Mini going? Where will it be in 10, 20 or even another 50 years' time? Perhaps it's rather ambitious to look that far ahead, but one thing is certain, Mini is a brand not only with a great tradition, but also a fantastic future.' He continued. Mini is expected to launch the all-electric Mini E, a more powerful diesel model and a production version of the Crossover concept within the next two years.